Not only is this Norman Pieced Spangehelm a nice looking piece, but it is also historically accurate, having been worn by the Normans during their conquest of England. Other cultures also used this helm, thanks to its effective yet simple design. Spangenhelm is a German term, originally applied to this helm because of its manner of construction. 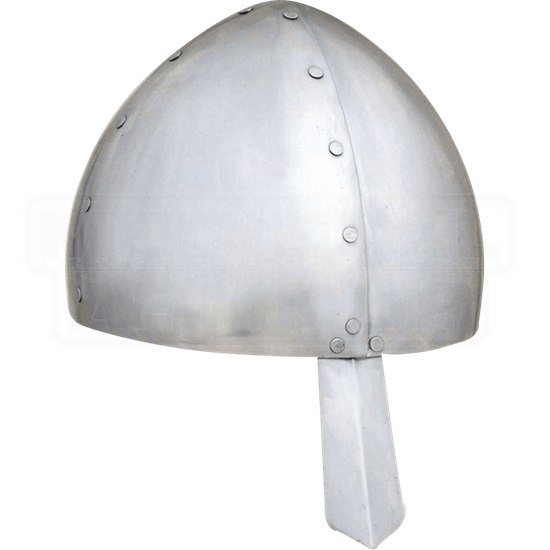 This helm consists of metal segments of 18 gauge steel that have been riveted and secured together, forming a subtly pointed skull cap that fits atop the head, while also featuring a nose guard that extends down and covers the nose. The helmet also features an adjustable leather liner along its interior, providing slight padding while also allowing extra room for additional padding, like arming caps. Being made from 18 gauge steel, this helmet is quite sturdy, although it is not made for use full contact reenactment. It also features a polished finish that makes it all but gleam in the light. Of course, you can use this Normal Piece Spangehelm to accent and complete your ideal Norman-oriented costume, or you could use it for a variety of warrior and soldier looks. Or you could display it as a part of your decor, so that all who visit can see this impressive piece of history.